Did you know that more uncompressed video content is moved in a year over networks that use Media Links equipment than all other media content networks combined? That’s because Media Links has a well-deserved reputation for high-quality, ultra-reliable networks that can efficiently transport content for the most critical, high-profile applications. Media Links solutions have been used to build some of the world’s largest video and media transport networks, including major installations in the USA, Europe, Japan, and Australia. For example, Media Links is providing the core media networking technology for Telstra’s next generation digital video network (DVN2) for broadcasting. Telstra is the leading telecommunications and information services company in Australia. IP-based technology from Media Links has been the backbone of soccer World Cups, winter and summer Olympic events, major US American Football events, Asian Games, and many other high profile global sporting events since 2002. In each case, the Media Links solutions have been used by major broadcasters to transport broadcast signals from these events to destinations around the globe. Media Links was founded with the vision of developing innovative and superior technology to enable and enhance the viewer experience throughout a connected world of video. To realize this vision, we have developed groundbreaking technology to facilitate the movement of all types of media content across IP networks. Our mission is to offer our customers intelligent solutions developed with ingenious technology tailored to their present and future needs. We are truly revolutionizing the way media content is being transported. Media Links continues to deliver groundbreaking products that help broadcasters realize the benefits of IP networking, including lower cost bandwidth and dramatically greater flexibility. Operating as a pioneer at the forefront of technological innovations and advancements, Media Links provides a broad range of standards-based products that allow telecom networks to efficiently and reliably transport live and pre-recorded signals for any type of broadcast application. “To receive this award is a great honor for us, and we are thrilled to have been recognized by our peers and the Academy of Television Arts & Sciences for technical leadership in the media industry. In 2014, The National Academy of Television Arts & Sciences (NATAS) honored Media Links with a Technical & Engineering Emmy® Award for excellence in engineering creativity, innovation and vision. 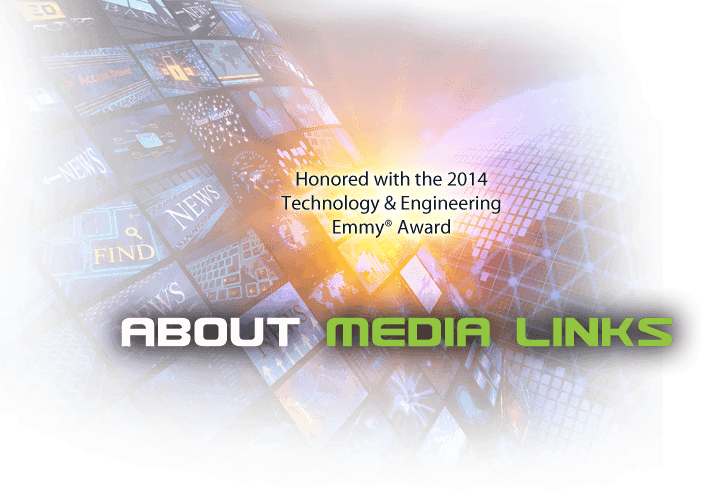 Media Links received an Emmy® Award for Standardization and Productization of JPEG2000 (J2K) Interoperability. J2K video compression offers broadcasters and network service providers a method to transport high quality contribution video with extremely high video quality and minimal latency over IP/Ethernet networks. Through the work of the Video Services Forum (VSF) and manufacturers such as Media Links, widespread adoption of its JPEG2000 technical recommendation is allowing an interoperable method of formatting JPEG2000 streams for transmission over IP. With the adoption of this technical recommendation, signals can be handed off between carriers utilizing different encoding and decoding equipment, while maintaining interoperability. This technical recommendation allows for real-time streaming, as well as encapsulated audio and ancillary data over IP. Other advantages of interoperable J2K include virtually lossless compression, low latency, low end-to-end delay, and error handling providing very robust delivery of all types of content.